Dumpling Festival is just around the corner. 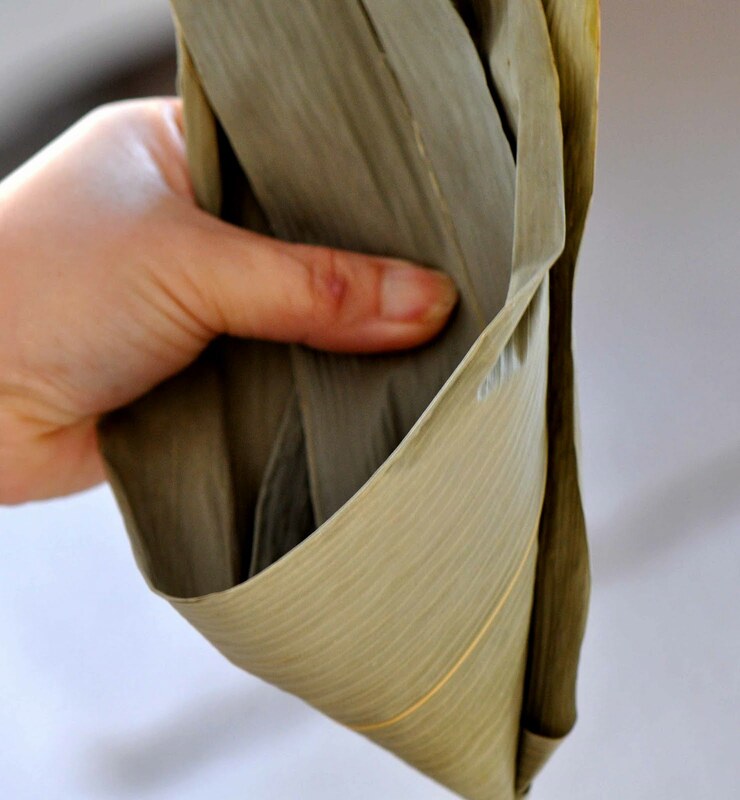 Previous years, Mamarazzi had made "Bak Chang"(Meat dumpling) and "Kan Shui Chang"(Alkaline Dumplings). 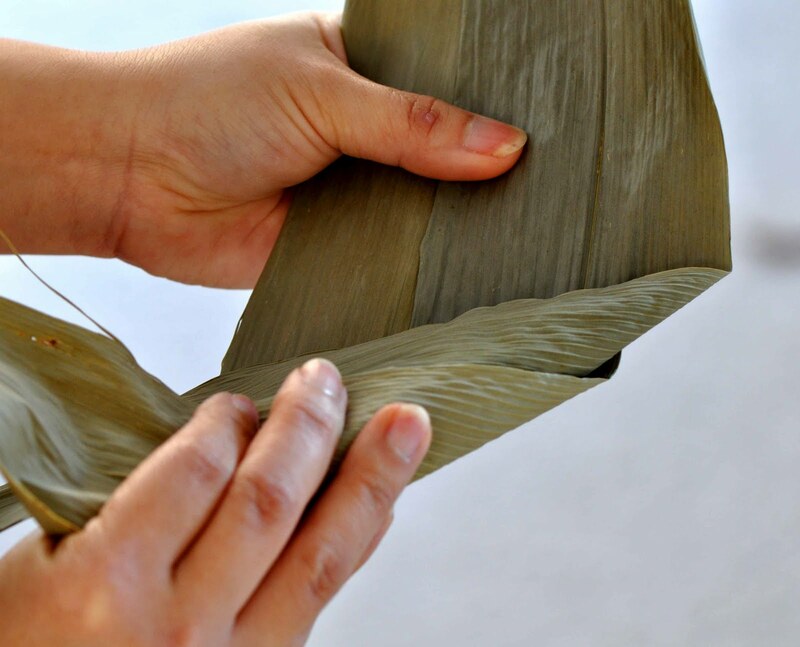 This year, Mamarazzi thought of trying her hands on different type of Zhang(dumpling) pulak. This round she thought of making Nyonya Zhang. 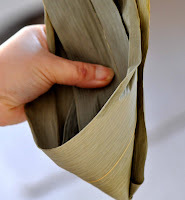 Uncle Arthur had kindly provided Mamarazzi with recipe for Nyonya Zhang from Shereen's blog. And Shereen had very generously given useful tips on making the Zhang. Well....as you know, Mamarazzi is lousy in taking instruction. Here is what happen to our Nyonya Zhang. The recipe calls for Melon Candies. Easily found from the local mini market. Then it required Coriander Powder. Alamak....how ah? Can't find. Hmm...Papa suggested that she buys the Coriander seeds then dry pan fried them before pounding them into powder. Don't I look like a little nyonya? Nice or not? I pound punya.. Supposed to use 500gm Pork Scotch Fillet(Cantonese called Mui Yuk) but if Mamarazzi go to the Pasar and ask for 500gm, sure the oink oink vendor laugh. Anyway, this is RM10 of it. 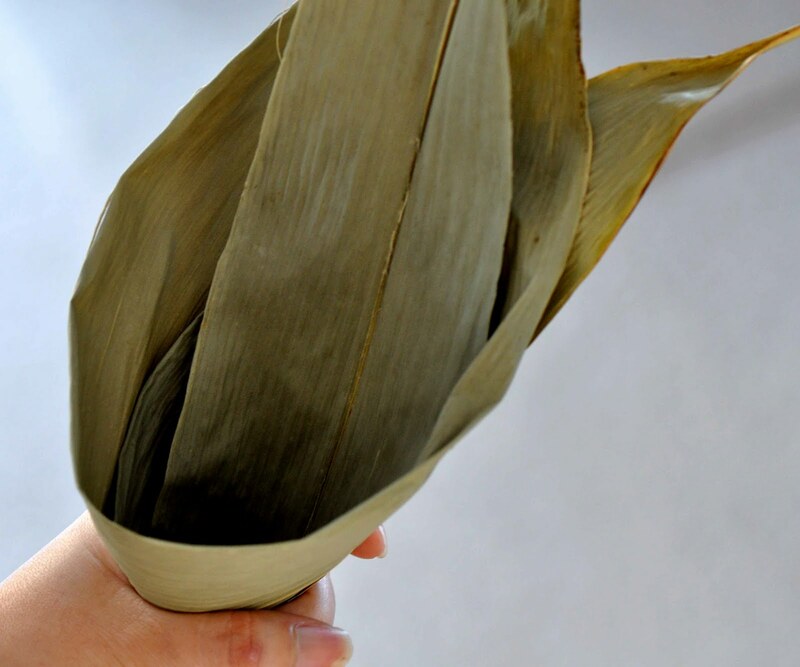 The recipe also calls for 100gm of the Glutinous Rice to be colored blue using blue coloring/Bunga Telang /Blue Pea / Clitoria Ternatea, but Mamarazzi could not find any of these. Then she got an idea. Ah Mah gave her some Pandan juice. Pandan juice add with a few drop of green coloring should be nice gua. 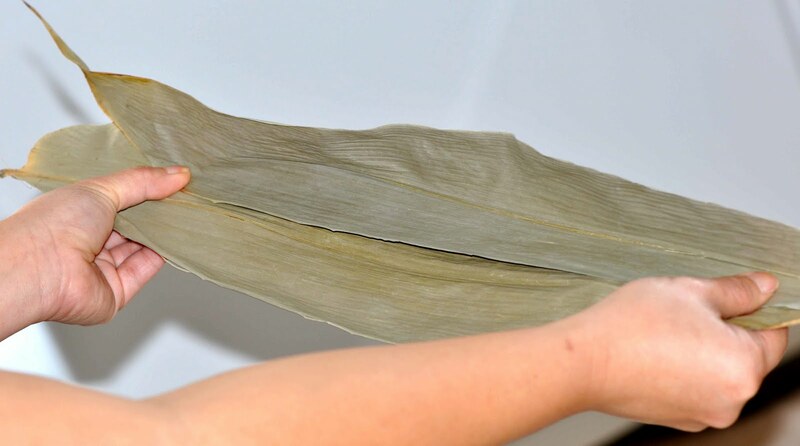 After all the recipe say put Pandan leaves when wrap the Zhang. Haiz....if Mamarazzi is in Shaolin temple as an apprentice, surely she would have been "逐出師門" (kicked out). Don't listen to Sifu teaching one. Sure the Sifu vomit blood. Jeng! Jeng! Mamarazzi's "Pseudo Nyonya Zhang" after 3 hours of boiling in the pot. While boiling, our house was fill with nice Pandan aroma. Look not bad lah. Papa ate one reluctantly. Then he asked for two more. Guess, it means the Zhang is acceptable gua? But he said the glutinous rice was a bit too soft. No need to boil that long. Maybe 2 hours will do. Mommy Ling pulak said nice. Not too soft. 500 gm Pork scotch fillet, cut into small chunks and boil in hot water until cooked. Toss in a colander to drain excess liquid and finely chopped. 125 gm Candied melon, finely chopped. Heat up 3 tbsp oil, saute chopped garlic, shallots, coriander powder and pepper until fragrant. Add chopped pork meat, candied melon and stir-fry until aromatic. Add seasoning, mix well and cook until thick. Taste and dish up. Leave to cool. 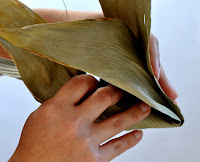 Fold bamboo leaf ( you need 2 leaves overlapping with the ends facing opposite direction into a cone and fill with 1 tbsp glutinous rice, make a hole and fill in 1 tbsp of meat filling, top with another 1 tbsp of glutinous rice, 1/2 - 1 tsp of blue coloured glutinous rice and a piece of pandan leaf. Cover and shape into 'chang', tie up with hemps or cotton string. Put Nyonya Chang into a deep stock pot, fill stock pot with boiling water until 3/4 full to cover all the dumplings. Cover and bring to boil, lower heat and cook for 3 - 4 hours until cooked and soft. Only 45 minutes is needed if cooking in a pressure cooker. You can use chicken meat instead of pork. ha ha ha, Not Nyonya chang, become incredible hulk chang liao! fuyoh!! mamarazzi, that one seems to be a successful dumpling mah..
actually the most difficult part is wrapping and tying the dumpling woh.. but mamarazzi did it!! and paparazzi from reluctant to eat and then to ask for two more!! successful lah like that!! this is not 逐出師門 lah, but because mamarazzi is 青出於藍 (means the student is better than the teacher) mah.. twist the recipe a bit and have your own style mah..
small kucing tarak makan?? he pound the coriander seeds one woh, gave so much help and effort, must reward him two dumplings mah..
Ok, now I can try... My mum was fed up with tying - always exploding so she would cook the filling, sandwich between two thick layers of pulut on a tray and steam. Cut into pieces like kuih when ready and eat... Also nice, saves the trouble of opening the chang. LOL!!! wah..so great! I don't even know how to make them..
Bak Zhang fit for The Hulk consumption. HAHAHA! Looks yummy, ur the one who's making me drool here. rofl! I love the pandan flavoured dumpling you made with the filling inside. The color is so vibrant and great job you did. I think I like the green rice better than blue. More appetizing as green. Thank you for the goose egg tip using a hard boiled egg...like that! To me taste good la....indeed your first attempt considered very pandai jor. Maybe will have market for the Incredilbe Hulk Zhang leh.